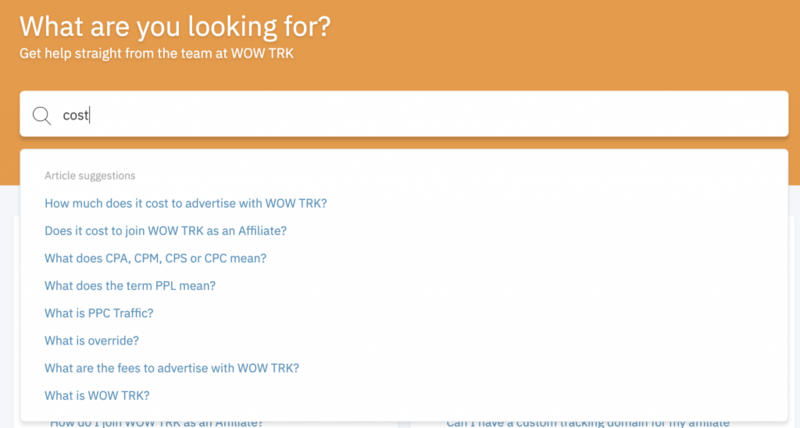 Today we welcome a brand new look to the WOW TRK Knowledge Base. Over the past few years traffic has steadily grown to our Knowledge Base as Affiliates and Advertisers have discovered the knowledge base and realised the instant value it can provide. Whilst we offer live chat support to Affiliates and Advertisers, this support isn’t offered 24 hours, 7 days a week and this is when the Knowledge Base can be extremely useful for an instant answer to a query you might have. We realise instant answers can have tremendous value for our clients which is why we regularly review what users of our Knowledge Base are searching and if we don’t have a relevant article to the query, we will update the Knowledge Base with an article to answer this query, for when its searched again in the future. However, whilst we regularly update the articles and add new articles to the Knowledge Base, it’s been 4 years since we refreshed the look of it. Today, we have launched a brand new look, with a focus on improving the readability and speed of the site. As you can see from the above screenshot of the Knowledge Base design, it was starting to look quite dated. Along with a refreshed look the search bar now also provides article suggestions as you type (similar to how Google does this when you are searching the web). A feature we think users will really appreciate. Also, we have dropped the ability to rate an article useful with “Yes” or “No” in favour of emojis (who doesn’t love an emoji? ), there are now 4 emojis to choose from to express how you feel about an article. The URL for the knowledge base has changed along with this refresh. We have decided to change the URL of the Knowledge Base from support.wowtrk.com to help.wowtrk.com, we feel it more accurately describes the content and it’s also quicker to type if you want to quickly load up the Knowledge Base. You can still access the Knowledge Base from support.wowtrk.com for the time being but we recommend if you have the site bookmarked you update this to the new URL. If you haven’t tried our Knowledge Base before now is the time to give it a try! 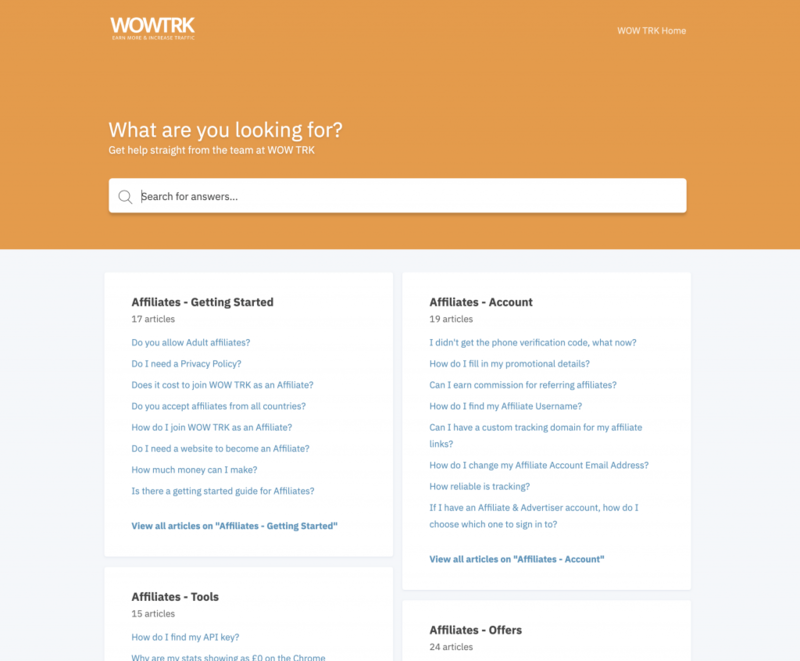 We think the refreshed look and new features make the Knowledge Base even more useful for WOW TRK Affiliates and Advertisers. Click here to visit the Knowledge Base and get instant answers to your questions.